During the hottest days of the year there’s nothing better than being able to get into your car and driving with the air conditioning turned on full blast. Unfortunately, if you’re driving an older Toyota, you might experience air conditioning that’s less than ideal. Instead of blasting cold air, it spits out lukewarm air instead. Nobody wants to drive on a hot day with an air conditioner that only blows hot air, so if that’s the case it’s likely time to take your Toyota in for an air conditioning recharge. 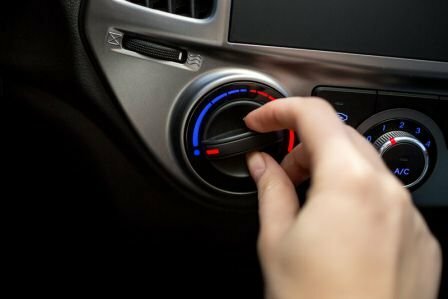 If you suspect your car’s air conditioner might need a fix but aren’t sure what the indicators are, the staff here at Westbury Toyota has put together a quick list of signs to look for, as well as some tips on how to go about the process of getting your cabin cooling system back in order. Obvious though it may be at first, the main signs that your car’s air conditioning needs to be recharged is that it’s stopped blowing cold air. If all you’re getting out of it is lukewarm air, it likely means that the AC system is low on refrigerant. However, it could also be indicative of a leak somewhere in the air conditioning system. If you’ve noticed a significant drop in your air conditioner’s cooling capabilities, it may be time to bring your car in so that a technician can give it a refrigerant top up. If you notice either of these, it’s most certainly time to book your car in for an appointment with one of our technicians – or, if you’re able to, put aside time to do the repairs and the recharge yourself. When you have your air conditioning turned on to the lowest temperature, you should normally be able to hear a clicking sound that indicates that the air conditioning clutch is engaging. As Eduardo Ruelas of Your Mechanic explains, the clutch is controlled by signals from the air conditioning pressure switch, a feature that monitors the pressure level in the entire system. If the refrigerant levels are too low, the switch won’t activate, which in turn means that the clutch won’t engage. Without the clutch working as it should, the system isn’t able to circulate the refrigerant, which will lead to a complete loss of cooling capability. Air conditioning/heating systems are complex and intertwined. Most defrosters in older cars make use of the air conditioning to remove moisture from the air. If your defroster isn’t working anywhere like it should be, says Matt Schmitz of Cars, it means that there’s likely a leak somewhere in the system that needs to be addressed. By taking care of the problem, you’ll be making sure that both your air conditioning and defroster still work exactly as they need to. While an air conditioner isn’t essential for driving, it is something that keeps drivers comfortable on those hotter than hot days. If you’ve got an older Toyota and it’s beginning to show signs that the air conditioning system is failing, it might be time to book it in with one of our Westbury Toyota technicians in order to keep everything running smoothly. Don’t leave it until it’s too late – if you see the signs, call in and book an appointment right away!